I’ve been fed up with Comcast, the cable TV company, for a long time now. They have a long history of (accidentally) charging me for services I don’t have, (accidentally) removing services I pay for, and (intentionally) deleting my favorite channels from the lineup so they can move them to other levels of service that I have to pay extra for. Meanwhile, I’ve long wanted to try this “over-the-air” HD thing I’ve heard so much about. Getting HDTV for free, and all I need is an antenna? But I kept thinking that it required the equivalent of a ham radio license or something, and that all I’d get would be one or two channels. So I kept pushing that thought to a back burner. Then I got this month’s Comcast bill and I decided enough is enough. An antenna, preferably one that can pick up VHF as well as UHF signals. If you live here in Celebration, I recommend the ClearStream 2-V, which right now is $83 from Amazon. A TV that can decode a DTV signal from an antenna. Any TV made in at least the past seven years should be capable of this. If you want a small TV to experiment with, I recommend the LG 22LN4510, a 22″ unit which costs $180, supports 1080p, and can also double as a computer monitor. Now go to either AntennaPoint.com or AntennaWeb.org and enter your address, and it’ll show you what TV antennas are broadcasting nearby. The major networks’ towers will probably be clustered relatively close together. Here in Celebration, a bunch of towers are about 35 miles away along compass heading 56° or so. That’s easily within the ClearStream 2-V’s range. Next, find a place inside your house to temporarily put up the antenna. Yes, inside! Assemble it, bring it upstairs (if you have an upstairs), and lean it against a wall in the direction it needs to point to “see” those towers you just found. Here’s what mine looks like, propped up by some lumber I had lying around The mesh piece is smaller than two feet tall, so this whole thing really isn’t very large. I am pleased with this lineup. If you’re not getting a good signal, then chances are your antenna’s not in a good position. Try re-aiming it, or moving it someplace else that might have fewer obstructions (walls, trees, other houses) between it and the transmission towers. If all else fails you might have to mount the antenna outside. The homeowners association can’t prevent you from doing that, but I really wanted to avoid it because I believe that an outdoors TV antenna in Florida is just asking lightning to come hit it. Now for the real magic. Having HD in one room is fine, but I want it to be available to all the TVs in my house! My house is wired like most other homes are (in Celebration at least). Somewhere in each house, probably in a closet, there’s a wall panel where the coaxial cable TV wire comes in from the outside world, connects to a splitter, and from there other coaxial cable wires run to every cable TV wallplate in the house. Well, wires are wires and signals can travel in either direction. I disconnected the cable TV wire coming in from the outside world. In its place, going into the “in” connection on the splitter, I moved the wire that goes to the room where I set up the antenna. Now the wire that used to deliver cable TV to that room can be used to get an antenna signal from that room. I went back upstairs and plugged the cable from my new antenna into the wall. Voilá! Now every room in the house can get the digital over-the-air signal! Well, okay, there are a few more considerations to keep in mind. First of all, the length of the cable from that room to your wall panel and then to another room might be so long that, by the time a signal runs that distance, it’ll be weak. I have a coaxial signal booster that I got a few years ago from Radio Shack. I keep it in the wall panel and I haven’t had any trouble with signal strength. You’ll have to set up any TVs or TiVos in your house to see the new channels. If you have a TiVo Premiere, this involves moving the coaxial cable from the “Cable In” plug to the “Antenna In” plug. I forgot this step and was confused why I wasn’t seeing any signal. If you want to watch TV in the room where you have your antenna, just use a cable splitter: the wire comes in from the antenna, one side goes out to the TV, the other side goes out to the wall. If you have an old TV (or TiVo) that can’t handle digital cable, you’ll need a digital converter box. TiVo has an article that lists all the digital converters that can be controlled by the TiVo unit with an infrared transmitter. These converters were all the rage in 2009 when the digital transition was going on and TV stations were no longer allowed to transmit non-digital signals, but these days there’s not as much demand for these, so they’re harder to find. Fortunately I was able to pick one up on eBay on the cheap, and it works fine for me. I already have all my Comcast equipment boxed up and ready to return to them. I’m going to shake things out for a few more days, but I’m fully expecting to be able to call them and cancel my cable service and be done with them forever. Now, the downside: I’ll be losing Food Network. And the Disney Channel. And SyFy, and CNN, and Animal Planet, and G4, and all those other stations that might have something I like to watch every now and then. But there are plenty of other services that carry some of their shows: Hulu Plus, Amazon Prime, Netflix. And if I still can’t get the shows I want … well, their loss. There are plenty of better ways to spend my time. We’re entering a new age of media delivery. Times were, if I wanted to watch anything outside the major networks, I signed up for cable. But these days there are lots of ways to watch the shows I want. If cable companies such as Comcast want to keep up, they need to see that they can’t keep dictating lineups and prices to their customers and playing tricks like switching things around and hoping people will just keep paying more. Customers have better options out there, and they will leave. I got rid of my AT&T U-Verse 6 months ago and went to on air Television and on line streaming with amazon prime and save one hundred plus dollars per month. 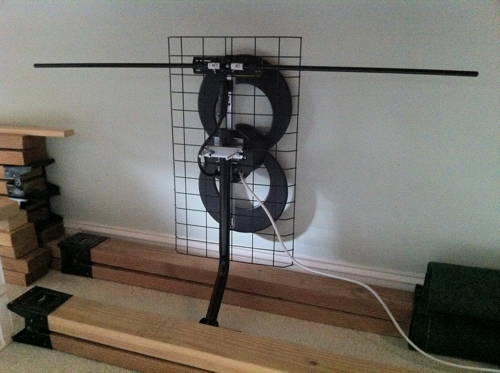 I placed a exterior antenna in the yard, did the work myself and was up and running in 1 day…. My only regret is I did not do this earlier…..